I’m overhauling my craft/sewing/guest room and just had to make a fun diamond tufted custom headboard! I was full of false hope and excitement when I saw this craft cover button kit. I was like “Easy Peasy – this will be the quickest part of the entire project!” Wrong. So wrong. a Paint Stir Stick (free at your local hardware or home improvement store usually!) or a wood scrap you have hangin’ around your garage. Your Hot Glue Gun or a strong, quick drying glue/adhesive maybe like some Super Glue? This is going to be your new best friend and will save your poor little thumbs so much anguish! But if you are using thicker, upholstery fabric, it will not be as neat and securely STUCK on there so it’s SUPER IMPORTANT that you did the Gorilla Glue steps above. You might even want to take it one more step like this and paint some Mod Podge on the back so that the fabric edges are really in there and won’t even THINK about fraying or separating out. I mean – once you have any completed upholstery project – the last thing you EVER want to do is to have to take the thing apart and replace the freakin buttons! Amiright? So now you can sit back and bask in their completed beauty. See how the Gorilla Glue expands and bubbles out a little bit? You know that’s gonna be SECURE, buddy. MAKE SURE to wait 24 hours so that the Gorilla Glue is REALLY good and dry before you start ganking on them completing your project. Aren’t they fantastic and all profesh looking? I can’t wait to finish the headboard after MY 24 hour drying period is up! Make sure to PIN THIS IMAGE where it’s handy for your next upholstery project that needs BUTTONS to match! Make sure to sign up for our email list so that you are notified as SOON as my headboard is done so you can check it out. It’s gonna be fan-freakin-tastic. In the meantime – happy creating, friends! Thank you so much! You saved the day! I’m so glad to hear it, Melissa! Thank you, thank you, thank you! I am quite frustrated at trying to use the kit. I will try your method tomorrow. ? I was too, Karla! You are so welcome. I’d love to see what you are making! You are amazing. We were seriously about to cry until we found this and it totally worked! I’m so glad it helped you out, Jen! I know exactly how you felt. Great post. Wish I had seen it 3 days ago. 15 of my 29 covered buttons popped off when I was securing them to my tufted headboard. I finally did buy some gorilla glue, but failed to glue the shanks. I lost a few more because of that. Finally finished. I sure hope these critters stay put, but if not, I’ll use your method. Thanks a bazillion! I was in the same boat! So frustrating. I hope yours stay put, but if not, do it this way and you’ll be done with it once and for all. Thanks for stopping in! Omg thank you. Got soooooo mad at my thick fabric. Common sense rules the day! Agh! I just tried using the kit with my thick velvet upholstery fabric for a couch I am restoring, and I got so frustrated that I took the kit back! Thank you for sharing this – I’ll go back and repurchase the kit, plus the gorilla glue, and try again, using your method! I know exactly how you felt…. I’d love to see the couch when you’re finished – sounds wonderful! So glad I bumped into this, been dealing with these things for 40 years…., duh..never thought to glue them. And you are sooo funny! Thank you for posting this, getting ready to do a chair so it’ll be a snap now. Thank you again. Thanks, Jan! I’m so glad you bumped into this too. I’d LOVE to see a picture of your chair when it’s done – pretty please?!? Now THAT was what they used to call “truth in advertising”… and so so funny! Over they years I have done everything from wedding and prom dresses to rv upholstery and chair refitting — and NOTHING I have ever read on the internet has ever been so up front and refreshingly honest. It actually inspires me to do some other new project, just knowing that I am not the only one who has trouble with these supposedly “easy-peasy” tasks! Great job! Wow! I’ve had the same trouble with those craft store button kits. And the pro covered button machine is sooooooo expensive. Luckily I have a friend that has one. Can’t wait to see your headboard!! There is a store on Etsy where you can get good upholstery supplies for your projects called UpholsteryMania. They have really good batting!! That’s good to know, Alice Ann! Thanks so much for the tip. The batting at our local stores leaves a LOT to be desired. 🙂 Have a wonderful day and thanks again. I was struggling to cover 22 buttons with a heavy velvet. I found out there is a pricey machine that upholsterers use that cuts fabric and makes sturdy buttons in seconds. I called an upholsterer that I had used a few years ago and he volunteered to make them for me. It took him about 5 mins… no charge! He even loaned me a special cutting tool that you attach to a power drill to hollow out the foam for better tufting. Even if I had to pay for the buttons it would have been soooo worth it! I’m making the buttons for my upholster cause he won’t do it so you were very lucky. Great post! 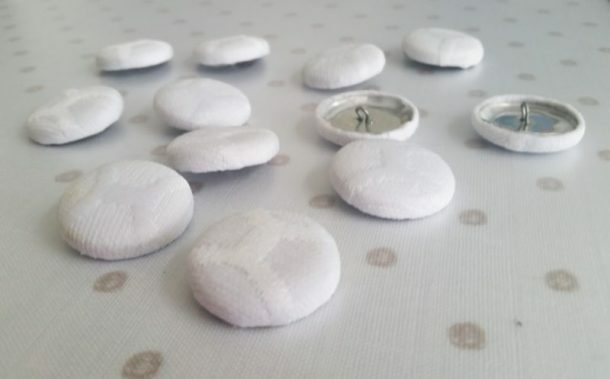 It really bugs me that there are two options for upholstery buttons: 1) cheaper-than-cheap Dritz or 2) $150 professional button maker. THERE MUST BE A MIDDLE GROUND! I can’t for the life of me figure out how many buttons I’m getting in this kit and what size they are? I’m facing the battle of buttons! I’m using leather vinyl looking fabric and I’m really thinking it might be to think but argh I wanted a leather headboard! Any who I’ll try gluing the fabric to the button like you said and maybe adding a touch of supper glue just to keep the fabric in place while I get the button back down. Its really been frustrating because I’ve been trying to build my own bed and nothing seems to be going right for this project. The buttons were supposed to be the easy part. Ha, easy yeah right. The package lies!!! Thank you for posting this I hope it helps because I have like 96 of the suckers to do and I’m beginning to seriously doubt this project. Love this post. Informative and entertaining! I spent the evening struggling with one button and thick upholstery fabric. Glad to know it wasn’t just me! I need to cover 48 buttons, on a couch I reupholstered and thought by the time I finished the buttons the couch would be outdated. I will trying this tomorrow. Did you ever get the leather/vinyl to work? I have tried for two days using the glue etc. The excess fabric is too bulky. I didn’t! That might be a job for professionals, unless we want to spend a bunch on our own machines.